I had my introduction to authentic French cuisine when I traveled to Paris last September for a business trip. No matter where I ate, everything was just so delicious. Back here in Manila, there are only very few restaurants that serves authentic French cuisine in the same quality as I remember it in Paris. 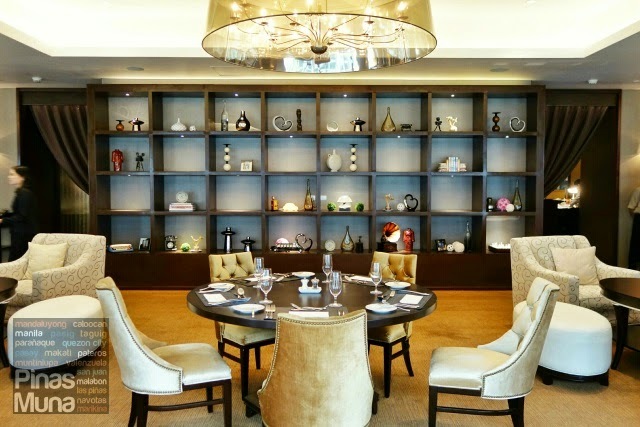 One of which is The Nostalgia Dining Lounge at the Oakwood Premier Manila, in Ortigas Center. This March, Oakwood Premier Manila's resident French Executive Chef Jérôme Cartailler will be serving an extensive selection of French Classics in a special Nostalgic Culinary Week menu. However, this celebration of French gastronomy will only be available until March 31, 2016. Fortunately, we were invited by the Nostalgia Dining Lounge last week to try some of the French dishes on the menu. We started our lunch with the Salad Lyonnaise (P395), a salad dish which originated from Lyon, France. It consists of mesclun greens, bacon, croutons, soft boiled egg and mustard-red wine vinaigrette. The salad was prepared next to our table and served freshly made. Next to be served was the Onion Gratinée (P375). More commonly known as French Onion Soup, this French classic is made of a rich broth of meat and onions, served in a bowl topped with puff pastry. The idea is to crack the puff pastry and consume it piece by piece with the onion soup. After finishing our soup, our attention was drawn to another appetizer. The Half Rock Lobster Tail Thermidore (P650) is another classic French dish made of creamy lobster ragout, stuffed in a lobster shell and gratinated with cheese. This appetizer is a perfect example of French cuisine which is made with high quality fresh ingredients and served in generous amount. I am not a big fan of tartare until I tried it in Paris. It's amazing how they could make raw meat taste so delicious. The Beef Tartar (6oz at P625) served to us reminded me of the tartare de bœuf I tried in a restaurant located at the Grands Boulevards in Paris. For the main course, we had the Grilled Whole Spring Chicken (P735) which is served with a variety of grilled vegetables and potato gratin. For its quality and price, it is a great value for money since it is big enough for two persons to share. If you want something light, then the Baked Seabass in Salt Crust (P850) has a very delicate flavor. It is served with grilled vegetables and a lemon-extra virgin olive oil emulsion which you can drizzle to the fish to bring out its flavor. For dessert, we had the Pear in Red Wine (P265). The pear was poached in spiced and aromatic red wine and served with vanilla ice cream. We also had the Creme Caramel (P195) which is a custard dessert with a layer of soft caramel on top. It is similar to creme brulee without the hard caramel topping. Let me end this article by quoting a man I saw in a French documentary about French cuisine. He said, une journée sans bien manger est une journée perdue, which means "a day without good food is a day wasted." So don't let your day come to waste by trying the French Classics at The Nostalgia Dining Lounge. Call +63 (02) 637-7888 local 8604 and reserve your table now.